William Conor is one of Northern Ireland’s best-known and most-loved artists. Known as the People’s Painter, he took inspiration from all aspects of life, from the city to the countryside. In The People’s Painter, a new three-part series, presenter Kerry McLean attempts to find out what Conor’s paintings look like if modern-day surroundings and people were the subjects? 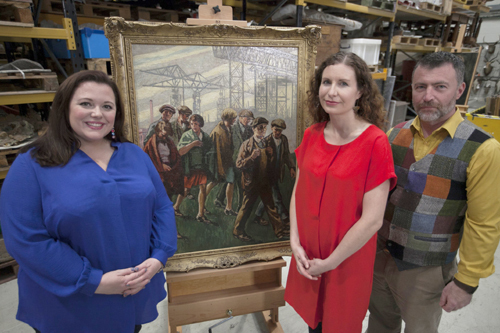 The People’s Painters (BBC Two Northern Ireland, Sunday 3 February, 10pm), is an Alleycats TV production for BBC Northern Ireland with support from Northern Ireland Screen’s Ulster-Scots Broadcast Fund. Born in north Belfast in 1881, Conor had strong Presbyterian and Ulster-Scots roots and was often seen in and around the Shankill area, leaning on lamp posts or shop fronts sketching the local people going about their daily routines. His main body of work was during the first half of the 20th century when he would sketch and paint whatever caught his eye, whether it was shipyard workers, politicians or children playing. He travelled all over Ulster capturing all aspects of life and society, in his sketch books and canvases. More than 50 years after his death on February 5, 1968, how would the world of today look when interpreted ‘Conor-style’? Presenter Kerry McLean decided to find out and invited amateur artists to apply for the chance to create their own contemporary ‘Conor’. From more than 100 applicants, five were selected: student Tessa Wilson from Kilkeel; Mark Bonello, a truck driver from Coleraine; Diane Wilson, a community art facilitator from Ballymena; Belfast receptionist Moyra Blaney and Darren Gibson, a teacher from Londonderry. Over the course of three programmes, the group study the great artist’s work and create their own modern-day interpretations on his favourite themes – work, everyday life and portraiture. Each week, art historian and curator, Riann Coulter and professional artist Nigel Allison, select which piece of work most evokes Conor’s artistic style and ethos. Guest judges include mural artist Mark Irvine, Kay Cullen, President of the Ulster Society of Women Artists, and Conor enthusiast and art collector, political journalist Eamonn Mallie. As well as following the competitors’ progress, the three programmes also explore the life of William Conor, and feature expert contributions on his work. In episode three, the overall winner is announced and their chosen painting is exhibited, alongside rarely-seen Conor’s masterpieces in a gala exhibition.